Writing content is crucial to building your business’s digital presence; it plays a key role in delivering targeted messages to your target audience and, if done well, can increase your online ranking. Content creation is a much-used route to market for many businesses and interesting, high quality, SEO-friendly content can even acquire a high-density keyword matrix that Google will love. However, content by itself is not an effective strategy but merely a single facet within the prism of possibility that is digital marketing. You could be missing out on huge untapped potential that a well-planned, multi-pronged digital marketing strategy (DMS) can provide your business. Digital marketing can empower even the smallest of businesses to garner the attention of a new customer-base that transcends geographical location. 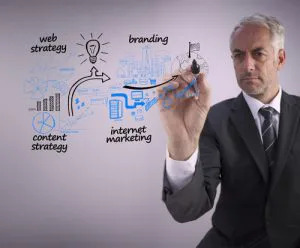 However, digital marketing works best when it’s part of a multi-pronged strategy that incorporates both content writing and SEO as part of a larger DMS. So, what exactly is a DMS? A DMS is a range of measurable actions that will help your business to achieve pre-defined marketing goals through carefully selected online marketing channels and platforms. Plan where you want to take your business by assessing where you are. Which platforms are you currently active on, how engaging is your content, have any of the engagements converted into sales? To create an effective DMS one needs to have as much pertinent information about what’s working and what isn’t, what marketing channels to incorporate and which ones need to be reviewed. Develop a profile of your ideal customer; know who they are, what they do, what their concerns are, and how you can help them. Building a buyer persona, based on what your business can offer, will further inform the strategy and ensure that your message and content are all targeted and geared toward meaningful engagements with this specific customer. You always want to be in front of your target audience so that you can engage with them. To do that, you need to know where they are. This ability to ‘hang out’ with your target audience is the very thing that has revolutionised marketing. Businesses no longer need massive marketing budgets to get leads. Your DMS will include such key information as where your ideal customers are ‘hanging out’, measurable marketing goals that align with your overall business goals, and which digital marketing tools will best serve your business’s needs. Once you’ve audited your current digital state, use the information to inform the DMS by having a clear vision of the elements that will make up an effective, goal-orientated strategy. The DMS is a working strategy that should be regularly evaluated. The strategy can be tweaked to keep up with ever-changing trends and to ensure that the strategy is aligned with the overall defined goals of the business. Build a digital presence one digital marketing strategy at a time…. PreviousPrevious post:Learn how Digital Expertise can enhance your Marketing StrategyNextNext post:Could the Construction Industry be the next Digital Marketing Powerhouse?